In 2015, Chris released his first Hellenic prayer book for the permanent market, which was an offshoot of an earlier version called The Zantean Prayers. The publication hosts 100 brand new prayers to ancient Greek Gods and Heroes. Being a devotee of the Hero Theseus, Chris released a book in 2016 detailing the ancient Athenian's amazing life, mysteries and virtues. A rarity on the market, as it's ancient Greek religion and history told from the perspective of a Greek Polytheist. Chris' most popular book to date remains Light Of Olympos: Ancient Greek Rites and Prayers for Everyday Life. Being sold in the United States, United Kingdom, Netherlands, and Canada, it retains top ratings from all reviewers. In 2017, Chris released his first autobiography and religious memoirs, mainly detailing his amazing spiritual experiences throughout his life that led him to become a Hellenic Polytheist. Hellenic Polytheism: A Personal Guide for Ancient Greek Practitioners is Chris' 2nd book to detail the basic religious and spiritual life of a practicing Hellenist. Lives and Prayers of the Greek Heroes and Heroines is a daily, monthly, and annual guidebook for Hellenists and Pagans seeking to strengthen their relationship with ancient Heroes. Chris' first release in the renowned publication Witches & Pagans Magazine is a story called In Her Light, in which Chris talks about how he battled his depression through ancient Greek spirituality. It also details his childhood growing up in rural North Carolina, and how it helped him build a Pagan perspective on life. In the summer 2018 edition of Mad Scientist Journal, Chris released his fictional tale called Last Confessions of a Deranged Physicist, a chilling tale about a young mad scientist who finds a way to tear a natural hole in time and space to escape the life he hates, but finds out that it wasn't the worst that could happen to a person. From 2017 to 2018, Chris was a consistent writer for the Ohio horror publication known as Dark Dossier. Issue 14 features his story Deepest Doom, which was written for the first time when he was in college in 2007, and dedicated to the professor of his creative writing class of the time, Mark Branson. The story follows a young man who is routinely abused by his grandmother, and opens with him being driven to murder her. His best friend being the only witness to the killing is torn between the choice to report the crime or help conceal it, but grandmother has one last round of hard knocks for her deranged grandson before she slips away to the bowels of the Earth. 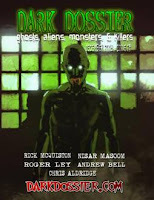 The Halloween 2017 edition of Dark Dossier contained several fictional and non-fictional tales from Chris. Those being The Darkness, Song of Sophia, and The Exorcist Memoirs, the latter being a true story of his own religious life. The Darkness follows the life of a young man who has been plagued by fears of being lost since childhood, never finding his way home, only to one day find it's now reality. Song of Sophia follows the story of a deranged mental patient who is haunted by a scorpion and a winged-donkey, personifications of his life. Only his favorite therapist can make them retreat for a time, but his obsession with her eventually becomes her own ruin. In issue 18, Chris released another true horror story called The Lost Union Soldier, about his days as a Civil War reenactor on the battlefield of Bentonville, North Carolina. The story details a ghostly encounter that Chris and his best friend had one night while camping out in preparation for the next day's battle. In issue 19, Chris wrote the fictional tale Unseen, about a young man who doesn't understand why people ignore him all the time. His only friends are books and cemeteries. He had always assumed that he was just unattractive and unapproachable, but as the pomegranate juice starts flowing through his veins, reality hits hard. The Lurker in issue 22 was one of Chris' most worked on stories since the winter of 2017. It follows a young man who is out of luck with a job he hates as a local paraprofessional. With the children and the stress of the job eating away at his mental stability, he becomes convinced that a diabolical toy doll is alive with a vendetta to kill the children, and only he can prevent it by turning the school on its ears. Issue 23 features part one of Memoirs of a Killer, a fictional tale about a young man who is angry at the world because of the way his life has been through the years, and goes on a rampage to rid the Earth of all human beings, that he may start the world over. Issue 24 features part 2 and 3 of Memoirs of a Killer, along with an additional story called The Return. Part 2 and 3 of the Memoirs finishes where the first left off, with the young killer trying to finish off his municipality, but is forced to flee to a new town because of divine intervention. There he prepares to make his final strike, his final solution. The Return opens with a young man who has been forcefully brought back to the town and area he despises and had tried to leave so desperately, but soon discovers that his best chance lies beyond the stars. The 25th edition of Dark Dossier that Chris was published in tells a story called The Ogre, based on the grotesque and incestual tales of Good Road in Illinois, the story follows a young man deep in the countryside of the state and is haunted by the deformed and rustic humans who inhabit the nearby forest. While walking, he is eventually pursued by one of the monsters, and ends up discovering a truth that will alter all he had ever known or chose to accept about his life. In the 29th edition of Dark Dossier, Chris returned to the publication with his tale titled The Consumption, for anyone who has ever hated their job so much that it literally threatened to eat them alive. Fortunately for the protagonist in this story, he finds himself with a choice that most people never get as they struggle against the monster that consumes us all. The year is 1626, and the only thing standing in the way of a complete Greek conquest of the New World is a vast sea and an opposing force of British redcoats that the traditional Hellenic General Citikos is only eager to take head on, in his mission to exceed the accomplishments of Alexander the Great. But Citikos finds more than an English enemy and an uncharted wilderness waiting for him. A beautiful Cherokee princess steals his attention, and he must choose between the defense of the indigenous people he has come to love and admire, and his own thirst for power and fame. Inspired by real people of Greece and North Carolina, A Greek's Conquest is the fiction and fantasy that will capture the attention of alternate history readers and lovers of romance. North Carolina was never considered a magical land until Leo uncovered its hidden realms. In the deep, rural confines of a long forgotten town called Thomasville, a young southern boy with a dull life but a taste for adventure, embarks to discover the secrets of a mysterious folk text that transports him into a parallel universe of tyrannical kings and stupendous superpowers. 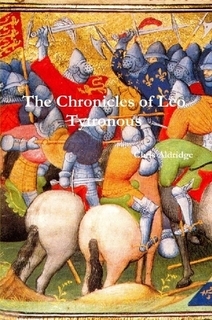 Trapped there until he can manage to retrieve the other transport book from the land's mighty magician monarch, Leo must learn how to harness the kingdom's magic, and gain enough experience and inner strength within a few short days, and hope it will be enough to defeat the mad sorcerer king with ages of knowledge. In The Creativity Webzine, issue 2, Chris' non-fictional story Gods and Heroes Among Us, talks about his real life experiences with the Greek Gods and the birth of his premature son. In Literary Orphans Journal, issue 32, Chris' fictional story My Time, My Space, was published, an epic tale of a young man who had spent his life being persecuted out of happiness by his government, only to obtain the powers of heaven for a short time that he may destroy the State and create a new reality. However, that reality is not what he expected at all. In August 2018, Chris began submitting true stories about his life as a martial artist, the first of which called Blue and True was accepted for website publication by USAdojo. On August 27th, 2018, Mad Scientist Journal, as customary, released Chris' story Last Confessions of a Deranged Physicist, onto their website. On January 22nd, 2019, the leader of the Supreme Council of Ethnic Hellenes in Athens, Greece took a liking to Chris' blog post that month outlining the falsehoods and exaggerations of Christian and Jewish persecution at the hands of Roman and Egyptian Pagans. It was called The Falsehoods of Christian and Jewish Persecution in Rome and Egypt. The Council asked if they could publish the post on their website as an article. Chris was more than happy to allow his people back in Greece to do so.